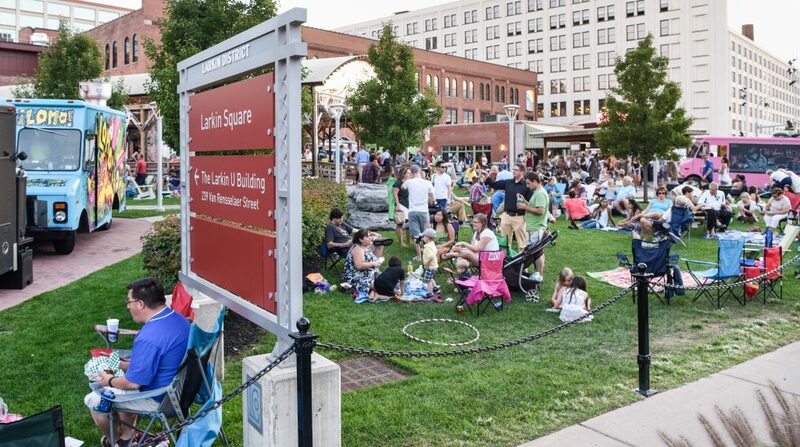 Food trucks are gearing up for another season at Larkin Square! 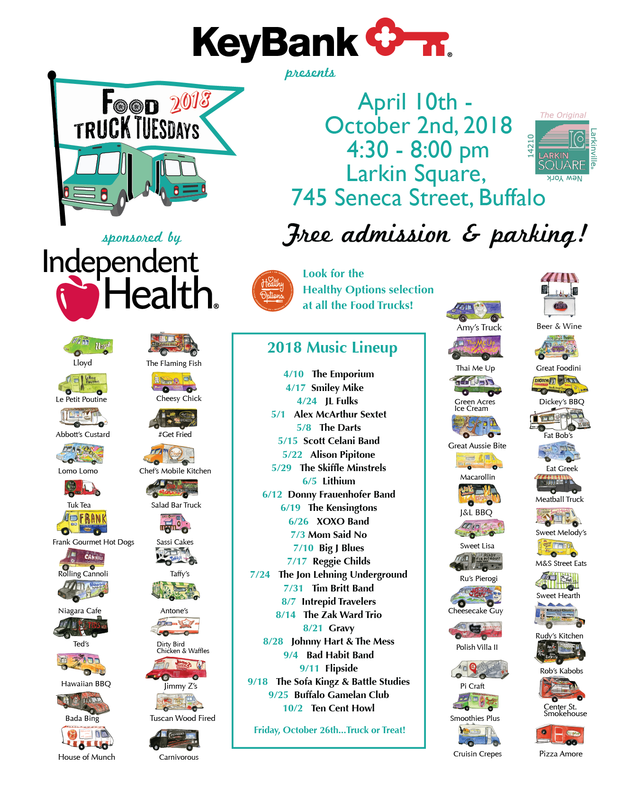 Food Truck Tuesdays begins April 10 and runs every Tuesday until October 2. The event is free and open to the public thanks to the generosity of presenting sponsor KeyBank and sponsor Independent Health. Western New York’s favorite food trucks will be back, along with several new trucks making their debut at Larkin Square. Also new this year, Food Truck Tuesday will officially open at 4:30pm. That means 30 extra minutes to feast on delicious food and enjoy the square! Each week, Larkin Square will host up to 28 food trucks with additional trucks parked at Flying Bison Brewing Company (840 Seneca Street). Visit larkinsquare.com each week to see the next roster of trucks. To round out the neighborhood-wide “dinner party,” the Hydraulic Hearth Restaurant & Brewery (716 Swan Street) will welcome diners to bring food purchased from the trucks into their beer garden, as will Buffalo Distilling Co. (860 Seneca Street) in their tasting room. In the warmer weather, the Swan Street Diner will be serving shakes from their take-out window. Guests are also welcome to enjoy their food on the plaza next to the Diner. Larkin Square is pleased to offer abundant free parking during the event. There is also $5-dollar preferred parking in the ramp adjacent to Larkin Square. Next door to the Swan Street Diner and across the street from Larkin Square is a new bike park for those biking to the event. We are also encouraging ride sharing to Larkinville. UBER is partnering with Food Truck Tuesdays to offer new riders a free ride to Food Truck Tuesday (up to $15) by using the code FOODTRUCKTUES.